Accessibility- Adhering to the Americans with Disabilities Act (ADA) the USSSA Space Coast Complex was designed to be universally accessible and comfortable to all guests. The complex provides services and amenities for fans. These include handicap parking, elevators, courtesy rides, accessible seating and accessible restrooms. Alcoholic Beverages- Alcoholic beverages may not be brought into USSSA Space Coast Complex. Collins Catering manages the sale and service of alcoholic beverages at USSSA Space Coast Complex. Guests are required to provide photo identification when purchasing any alcoholic beverages. From the South: I-95 North to Wickham Road (exit 191), left onto Wickham Rd., turn right at the traffic circle onto Lake Andrew Drive and follow the road approximately 1.5 miles through the Brevard County government office complex to the traffic lights. Turn right on Stadium Parkway; Space Coast Stadium is half-mile on left. From the North: I-95 South to the Rockledge exit (Exit 195). This exit cloverleafs around to face north. At the traffic light turn left onto Stadium Parkway. Space Coast Stadium is approximately three miles on right. ATM- The USSSA Space Coast Complex does not have an ATM on site currently. Animals- Certified service animals or service animals in training with documentation for guests with disabilities are welcome at the USSSA Space Coast Complex. All other animals are prohibited. Admission- Pricing at the USSSA Space Coast Complex will vary based on the event taking place. Please review your event details for specific information. 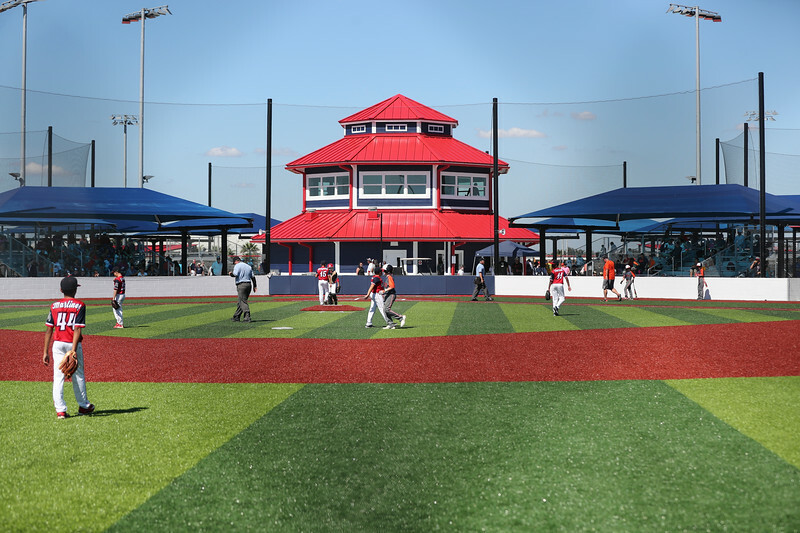 AstroTurf Policy- Due to the quality and maintenance needs of the AstroTurf at USSSA Space Coast Complex, peanuts with shells, sunflower seeds and gum are strictly prohibited. Athletes will only be permitted to wear molded cleats or other athletic shoes on the playing surface. No tobacco products, sports drinks or liquids other than water will be allowed on the turf. Bag Policy: All bags and purses brought into the complex are subject to search. Coolers are not permitted inside of the complex. Water is provided in each dugout for athletes and coaches and is available for purchase at all concession stands located at each quad. Banners and signs- Teams may bring appropriate banners and signs in to the complex. They must be hung on the back of the dugout, with a clip- no tape or wires. Batting Practice and Cages– Batting cages at the USSSA Space Coast Complex are not open to the public. Depending on the event they may be open for team use. Teams may also take batting practice behind the temporary fences in the outfield at their own risk. Bicycles- No bikes are permitted on the premises. Baby Changing Stations- Baby changing stations are available in the restrooms located on the concourse of the main stadium. Baby changing stations will be added to the other restrooms throughout the complex soon. Box Office- The box office is located at the entrance of the main stadium. Buses/RV-Buses and RV’s may drop off teams at the Red or White parking lots and then must proceed to the overflow parking lot located behind the blue quad. Catering- A wide variety of food and beverages is available throughout the ballpark at several permanent locations and portable stands. ELC Events is the USSSA Space Coast Complex exclusive catering partner. Each stand offers a full menu and Pepsi products. The menu is subject to change depending on the event. Chewing Tobacco- There is no chewing tobacco permitted on the playing field or any turfed areas. Cleats- Athletes will only be permitted to wear molded cleats or other athletic shoes on the playing surface. Code of Conduct– Coaches, players and fans all must abide by the USSSA bylaws while at the USSSA Space Coast Complex. Any guests found violation of Code of Conduct will be removed from the premises. Coolers- The USSSA Space Coast Complex does not allow coolers into the park unless medically necessary or the cooler contains only baby formula. Credit Cards- All major credit cards are accepted at the concession stands inside the USSSA Space Coast Complex. Credentials- During most events, athletes and coaches will be given credentials for entry to the complex at their event registration. They will need this with them throughout the entirety of the event for re-entry. Drugs- The USSSA Space Coast Complex has a zero tolerance policy for any illegal substances found on the premises. Any persons found violating this policy will immediately be asked to leave the complex. Dugouts- Dugouts and bullpens are for credentialed athletes and coaches only. Emergency Evacuation- In the event of an emergency, listen for instructions over the P.A. Entrances- The USSSA Space Coast Complex has entrances into the complex located at all of color-coordinated parking lots. The gates will be open depending on the event. Family restrooms- The USSSA Space Coast Complex has one family restroom located in the main stadium on the concourse level. Firearms/weapons- The USSSA Space Coast Complex strictly prohibits guests from bringing in any weapons or firearms into the complex. Any violators will be escorted out of the facility. Foul balls- The USSSA Space Coast Complex is an active baseball/softball park, for your safety, please be aware of balls flying in foul territory. If you retrieve a ball, please return to the umpire. Field access- Credentialed coaches and athletes only are permitted on the fields at the complex. Food/beverage- The USSSA Space Coast Complex does not allow any outside food or drinks into the complex. All bags are subject to search upon entrance into the complex. Concession stands carry Pepsi products and a complete ELC Events menu for purchase. Each stand offers a full menu and Pepsi products. The menu is subject to change depending on the event. . All dugouts have water for athletes and coaches. Gate openings- Gates will open one hour prior to the start of the first game of the day. Hospitality areas- Please contact spacecoast@usssa.com for information about hospitality areas. Inclement weather- In the event of inclement weather, please listen for the PA announcement for instructions. Ice- There will be no ice or ice bags handed out at the USSSA Space Coast Complex. Lost and Found- USSSA Space Coast Complex will use the Box Office as the lost and found. It is located next to the Boombah store in front of the main stadium. Lost children/guests- Lost children/guests will be escorted to the on site director. Merchandise- Boombah is the official merchandise affiliate of the USSSA Space Coast Complex. There is a Boombah store located at the main entrance of the stadium near the ticket office. Music- The USSSA Space Coast Complex strictly prohibits any music to be played on a portable speaker. Maps- There is a map of the USSSA Space Coast Complex located at the South Entrance of the complex. You can also access a map here. Noise Makers- There are no noise-makers allowed in the USSSA Space Coast Complex. Outside food and drinks- Bringing food and drinks from outside of the complex is strictly prohibited. The USSSA Space Coast Complex offers concessions by Collins Catering and Pepsi products for purchase. Parking- We have three paved parking areas that will be used as a primary location for guests to park their vehicles (red, white, and blue parking). If a guest has an RV, daily parking is allowed in the Overflow Parking Lot. RV’s will not be allowed overnight and will need to find an offsite camping grounds. Event parking will be determined based on the specific event. Restrooms- For your convenience, USSSA Space Coast Complex has restrooms located at the main stadium and the Blue and White Quads. Rain delay- In the event of a rain delay please listen to PA announcements for instructions or visit the event website for updates. RV Parking- RV’s must be parked in the overflow parking lot located behind right field of the main stadium. Please refrain from pulling the RV into the main parking lots to avoid traffic jams. Strollers- Strollers are allowed in USSSA Space Coast Complex. Seating- For your convenience, all fields at the USSSA Space Coast Complex have seating available. Solicitation- Solicitation at USSSA Space Coast Complex is strictly prohibited. Persons who violate this policy will immediately be removed from the property. Tailgating- When tailgating at the USSSA Space Coast Complex we kindly ask guests to refrain from using a grill, any open flame, consuming alcohol, no glass and no tents. Umbrella- For viewing purposes, USSSA Space Coast Complex kindly asks guests to only use personal size umbrellas inside of the complex. Viera- The new home of USSSA Space Coast Complex offers a wide variety of exciting family friendly activities. With beaches only a 15 minute drive from the complex and shopping dining across the street, Viera is the ideal town to host tournaments. Water- At the USSSA Space Coast Complex we provide water for players and coaches in each dugout. The coolers are refilled throughout the day. Water is also available for purchase at the concession stand for guests. Wi-Fi- The USSSA Space Coast Complex offers free Wi-Fi for guests. Users must agree to the terms in order to access the Internet.